Hello and welcome to the second group post for the November Papertrey Ink Release! The new products you are seeing here will be available in the store at Papertrey Ink on November 15th at 10:00 EST! I have some fun birthday themed projects to share with you today! The team is showcasing For You Stamp set and dies by Lizzie Jones, Basic Cut Tag Die, Window Cut Tag Die, and Wrap It Up Dies. Since I am so in a Christmas mood right now, I decided to do a Christmas themed birthday! I have several friends who have birthdays in December and even a couple who's kids birthdays are on Christmas day! This would be so perfect! For my first project, I created a fun little gift bag using the new Wrap It Up Dies. I love them!! The bow looks so real, and I adore the stitching! It creates the cutest little wrapped up package! 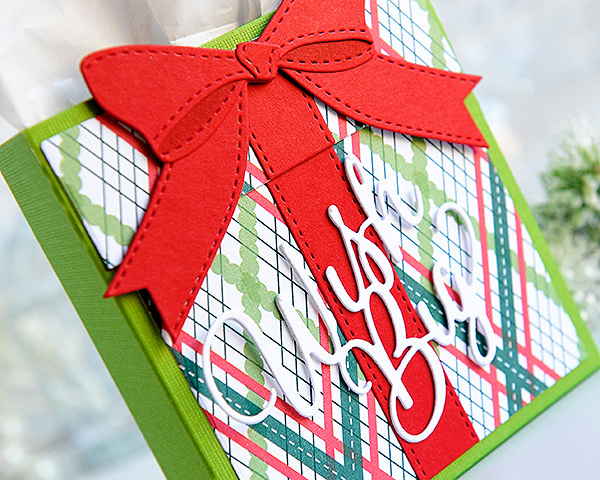 I used some paper from the Holiday Plaid paper pack for the box, then Pure Poppy card stock for the bow. I created the little box with the same tutorial that I use all the time. You can find it HERE. It's easy and fun, and I love it! After I had assembled everything, I cut the Big Basics: Wish Big die out three times, glued those together and glued that down to my package. 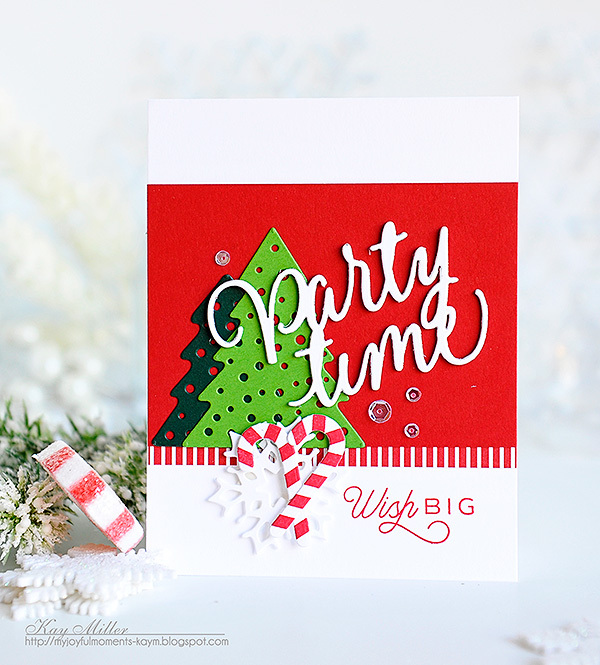 Next I made a card using the new For You Stamp set along with the Big Basics: Party Tie die, and a few other Christmasy things. The trees are from Tiny Town: Holiday Yard, and the Candy Canes are from Sweet Holiday Wishes. I added a little strip of Pure Poppy + White patterned paper underneath the Pure Poppy card stock for a little interest. 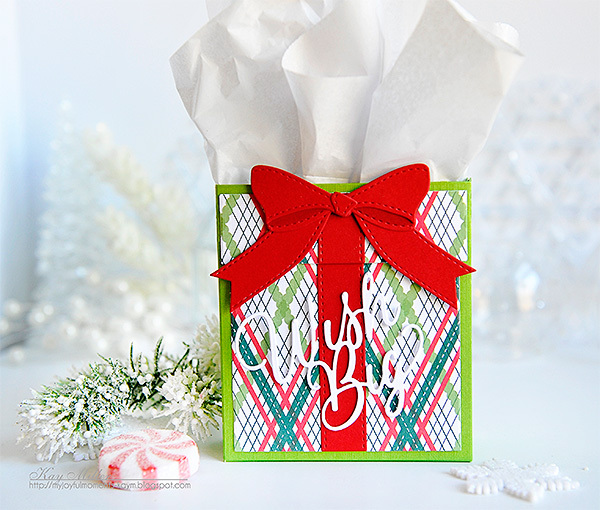 The candy canes are layered over a snowflake from the Fancy Flakes Dies. For my last project, I created a matching tag using the For You stamp set, For You Dies, Window Cut Tag, and Basic Cut Tag. 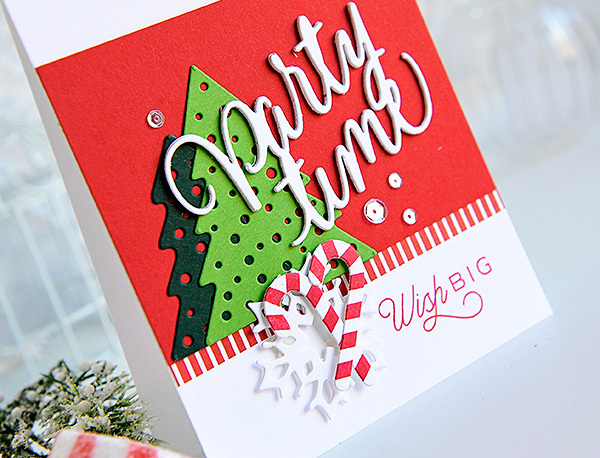 I cut the background die out of the red polka dot paper, the middle of the tag is cut with the Happy die that comes with the For You Dies, and the green layer on top is cut with the Window Cut Tag die. These are really fun with the way you can layer all the pieces! Then I Christmas-ed it all up with some greenery from Winter Woods, Candy canes from Sweet Holiday Wishes, gold stars from Star Scribbles and a big snowflake from Fancy Flakes! Thanks so much for stopping by! I'll be back tomorrow with another look at some of the fun new products coming to Papertrey Ink November 15th, at 10:00 EST! I always stop by your blog during the countdown and some of your projects never fail to inspire me to buy the products so I can case them (can't buy everything) I love your color combinations. I thank you for the inspiration and also want to let you know I cased your dress up dolls christmas tag for my nephew to give to his classmates. He loves them and can't wait to give them out on their christmas party. Class of 13 preschoolers, not that many to make. Sorry for the long comment. Thank you again and keep up the good work. Bold beauties today, Kay! Love the red and green, and strikingly vivid symbols of the season. Eye candy everywhere!!! Your projects are so festive, Kay, they really put me in the holiday mood!! Love seeing your colour choices for this morning. Impeccably Christmas, but with a real Kay flair. P.S. My birthday is December 26 and I love it when people give me Christmassy cards and wrap my hopefully fabulous gifts up in Christmas paper. After all, it's the most wonderful time of the year. Awesome projects. Thanks for the box tutorial...I Pinned it! Perfect for the Christmas Birthday gal! That would be our oldest daughter! lol You had fun! Beautiful designing Kay! Oh, your projects are so beautiful as always, Kay! Your lovely packaging surely puts me in the Christmas spirit!! 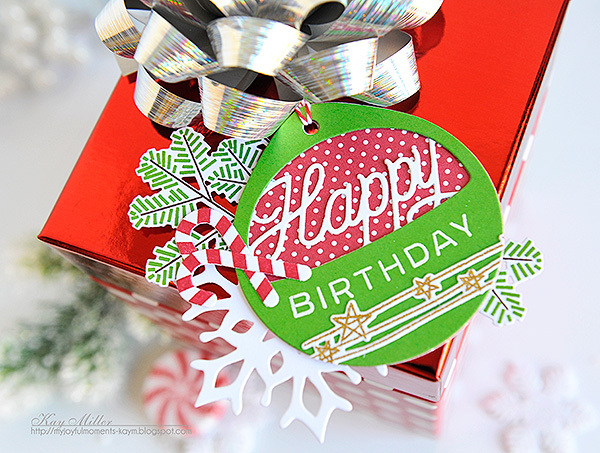 Awe-struck by your gorgeous projects/showcases that feature Christmas-themed birthday ideas (and being a December birthday gal myself, these have all the more impact). A fabulous selection of packaging where each piece is a gift in and of itself! Kay, these spell Christmas-time with a capital C. Love what you've done with each project in the traditional reds and greens. Another gorgeous post! 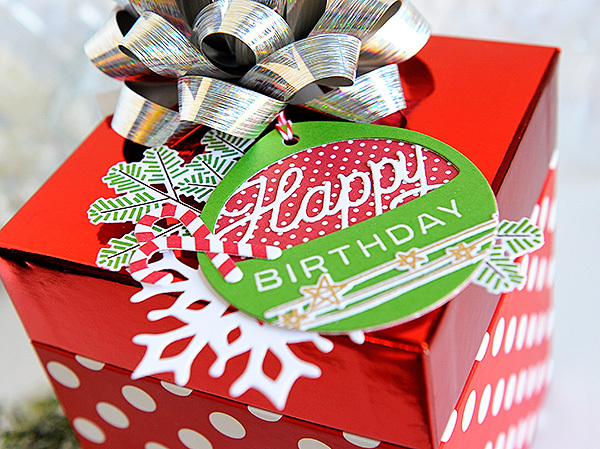 What fun December birthday cards and gift ideas. Love all the happy & bright colors! That first box with the red bow is just too adorable. Love them all! Having a birthday during the holidays made your projects special to me. I like celebrating both occasions together but usually get the typical birthday card. I would love to open mail that had something similar to your wonderful holiday birthday card. I have several friends and family members with birthdays during December so I will make their cards extra special this year thanks to you. Love your delightful projects today Kay! That new bow die is terrific!! How do I LOVE your work.......UMMM.....let me count the ways!!! I could go on and on but I will leave those for another day! Have I told you lately that you make me so happy? ...........SIGH! 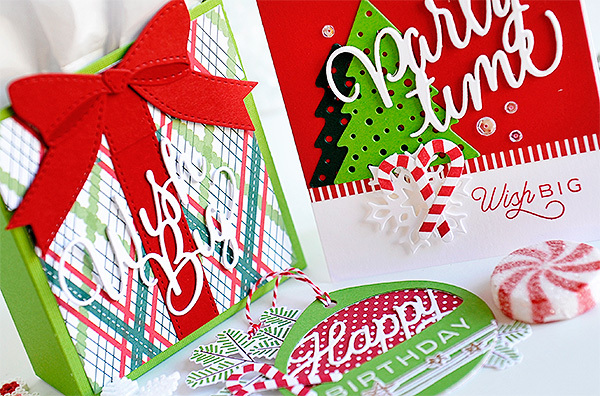 Beautiful projects in traditional red and green,love them! That bow on the gift sure does look real! Always fun to see what you create and I am always in awe of your work!